Our team is helping lead the way toward a molecular basis for the cause, diagnosis, and treatment of Alzheimer’s disease. Alzheimer’s is a $250 billion a year epidemic that will confront virtually all families. In an early breakthrough study, we introduced the idea that neuron damage leading to AD is instigated by small toxic oligomers of the Aβ peptide. This new idea emerged from our discovery that oligomers are potent CNS toxins that rapidly destroy synaptic memory mechanisms. Our seminal paper (MP Lambert et al, PNAS 95:6448-6453, 1998) has been cited over 3500 times (Google Scholar; see e.g., the review in Nature by Schnabel “Little Proteins, Big Clues,” Nature, 475, S12-14, 2011). Since then, we have collaborated internationally to publish more than 100 papers (with over 16,000 citations) investigating the oligomer hypothesis and how it might lead to mechanism-based diagnostics and therapeutics. 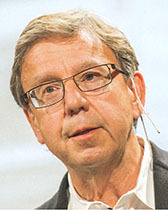 According to Eliezer Masliah, Director of Neuroscience for the National Institute on Aging, “Progressive accumulation of amyloid beta oligomers has been identified as one of the central toxic events in AD.” Soluble Aβ oligomers, rather than plaques, are now widely regarded as triggering the neuron damage that causes dementia. Toxic Aβ oligomers have provided, moreover, a structural archetype for cytotoxins germane to over two dozen diseases of protein misfolding (including diabetes, Parkinson’s, and prion diseases). Our ongoing research is highly collaborative and concerns five areas. (1) Therapeutics. AβOs are excellent targets because of their early role in causing brain damage. Therapeutic monoclonal antibodies are nearing clinical trials due to partnering between pharma and Acumen, a biotech built on our past work. New programs for drug discovery focus on insulin signaling (to block AβO toxicity) and on high throughput screening using nanoscale synaptic membrane mimetics (to obtain compounds that prevent AβO binding to toxin receptors). (2) Diagnostics. AβOs provide an optimal target for diagnostics because they appear early in disease and instigate the path to dementia. Ultrasensitive assays for clinical chemistry are being developed along with unique approaches to brain imaging by PET and molecular MRI. (3) Etiology. The cause of AβO build up in in late-onset AD is a major unknown. We are taking new approaches using non-transgenic models to investigate metabolic factors such as high sugar and fat diets associated with diabetes and hypercholesterolemia. (4) Cell and molecular mechanisms of memory loss. How neuron damage is triggered by AβOs is being investigated in brain cell culture systems and animal models. Experiments focus on early steps in the toxic mechanism. These include binding to toxin receptors, disrupted trafficking of ion channels and GPCRs, and altered signaling pathways. (5) Structural biology. State-of-the-art facilities are being used to discover the molecular organization of synthetic and brain-derived toxic oligomers. AβO structure is still poorly understood because of the difficulty in characterizing dynamic populations of oligomers in extremely dilute solutions. Approaches include cryoEM and unique native protein mass spectrometry. Collaborators include Disterhoft, Geula, Meade, Dravid, Luan, Kelleher, Mirkin, and Van Duyne (Northwestern); De Felice and Ferreira (Federal University, Rio de Janeiro); Sebollela (Sao Paolo); Mori and Tomiyama (Osaka); Cuello (McGill); Giacobini (Geneva); Nordberg (Karolinska); Gandy (Mt. Sinai); Sligar (University of Illinois, Urbana-Champagne). Cline EN, Bicca MA, Viola KL, Klein WL. (2018). The Amyloid-β Oligomer Hypothesis: Beginning of the Third Decade. J Alzheimers Dis. 64(s1):S567-S610. doi: 10.3233/JAD-179941. Pitt J, Wilcox KC, Tortelli V, Diniz LP, Oliveira MS, Dobbins C, Yu XW, Nandamuri S, Gomes FCA, DiNunno N, Viola KL, De Felice FG, Ferreira ST, Klein WL. (2017). Neuroprotective astrocyte-derived insulin/insulin-like growth factor 1 stimulates endocytic processing and extracellular release of neuron-bound Aβ oligomers. Mol Biol Cell. 28(20):2623-2636. doi: 10.1091/mbc.E17-06-0416. DiChiara T, DiNunno N, Clark J, Bu RL, Cline EN, Rollins MG, Gong Y, Brody DL, Sligar SG, Velasco PT, Viola KL, Klein WL. (2017). Alzheimer's Toxic Amyloid Beta Oligomers: Unwelcome Visitors to the Na/K ATPase alpha3 Docking Station. Yale J Biol Med. 90(1):45-61. Knight EM, Kim SH, Kottwitz JC, Hatami A, Albay R, Suzuki A, Lublin A, Alberini CM, Klein WL, Szabo P, Relkin NR, Ehrlich M, Glabe CG, Gandy S, Steele JW. (2016). Effective anti-Alzheimer Aβ therapy involves depletion of specific Aβ oligomer subtypes. Neurol Neuroimmunol Neuroinflamm. 3(3):e237. doi: 10.1212/NXI.0000000000000237. Viola KL, Sbarboro J, Sureka R, De M, Bicca MA, Wang J, Vasavada S, Satpathy S, Wu S, Joshi H, Velasco PT, MacRenaris K, Waters EA, Lu C, Phan J, Lacor P, Prasad P, Dravid VP, Klein WL. (2015). Towards non-invasive diagnostic imaging of early-stage Alzheimer's disease. Nat Nanotechnol. 10(1):91-8. doi: 10.1038/nnano.2014.254. Viola KL, Klein WL. (2015) Amyloid β oligomers in Alzheimer's disease pathogenesis, treatment, and diagnosis. Acta Neuropathol. 129(2):183-206. doi: 10.1007/s00401-015-1386-3. Wilcox KC, Marunde MR, Das A, Velasco PT, Kuhns BD, Marty MT, Jiang H, Luan CH, Sligar SG, Klein WL. (2015). Nanoscale Synaptic Membrane Mimetic Allows Unbiased High Throughput Screen That Targets Binding Sites for Alzheimer's-Associated Aβ Oligomers. PLoS One. 10(4):e0125263. doi: 10.1371/journal.pone.0125263. Forny-Germano L, Lyra e Silva NM, Batista AF, Brito-Moreira J, Gralle M, Boehnke SE, Coe BC, Lablans A, Marques SA, Martinez AM, Klein WL, Houzel JC, Ferreira ST, Munoz DP, De Felice FG. (2014). Alzheimer's disease-like pathology induced by amyloid-β oligomers in nonhuman primates. J Neurosci. 34(41):13629-43. doi: 10.1523/JNEUROSCI.1353-14.2014. Lourenco MV, Clarke JR, Frozza RL, Bomfim TR, Forny-Germano L, Batista AF, Sathler LB, Brito-Moreira J, Amaral OB, Silva CA, Freitas-Correa L, Espírito-Santo S, Campello-Costa P, Houzel JC, Klein WL, Holscher C, Carvalheira JB, Silva AM, Velloso LA, Munoz DP, Ferreira ST, De Felice FG. (2013). TNF-α mediates PKR-dependent memory impairment and brain IRS-1 inhibition induced by Alzheimer's β-amyloid oligomers in mice and monkeys. Cell Metab. 18(6):831-43. doi: 10.1016/j.cmet.2013.11.002. Kondo T, Asai M, Tsukita K, Kutoku Y, Ohsawa Y, Sunada Y, Imamura K, Egawa N, Yahata N, Okita K, Takahashi K, Asaka I, Aoi T, Watanabe A, Watanabe K, Kadoya C, Nakano R, Watanabe D, Maruyama K, Hori O, Hibino S, Choshi T, Nakahata T, Hioki H, Kaneko T, Naitoh M, Yoshikawa K, Yamawaki S, Suzuki S, Hata R, Ueno S, Seki T, Kobayashi K, Toda T, Murakami K, Irie K, Klein WL, Mori H, Asada T, Takahashi R, Iwata N, Yamanaka S, Inoue H. (2013). Modeling Alzheimer's disease with iPSCs reveals stress phenotypes associated with intracellular Aβ and differential drug responsiveness. Cell Stem Cell. 12(4):487-96. doi: 10.1016/j.stem.2013.01.009. Bomfim TR, Forny-Germano L, Sathler LB, Brito-Moreira J, Houzel JC, Decker H, Silverman MA, Kazi H, Melo HM, McClean PL, Holscher C, Arnold SE, Talbot K, Klein WL, Munoz DP, Ferreira ST, De Felice FG. (2012). An anti-diabetes agent protects the mouse brain from defective insulin signaling caused by Alzheimer's disease- associated Aβ oligomers. J Clin Invest,122(4):1339-53. Ferreira ST, Klein WL. (2011). The Aβ oligomer hypothesis for synapse failure and memory loss in Alzheimer's disease. Neurobiol Learn Mem, 96(4):529-43. Renner M, Lacor PN, Velasco PT, Xu J, Contractor A, Klein WL, Triller A. (2010). Deleterious effects of amyloid β oligomers acting as an extracellular scaffold for mGluR5. Neuron, 66(5):739-54. Tomiyama T, Matsuyama S, Iso H, Umeda T, Takuma H, Ohnishi K, Ishibashi K, Teraoka R, Sakama N, Yamashita T, Nishitsuji K, Ito K, Shimada H, Lambert MP, Klein WL, Mori H. (2010). A mouse model of amyloid β oligomers: their contribution to synaptic alteration, abnormal tau phosphorylation, glial activation, and neuronal loss in vivo. J Neurosci, 30(14):4845-56. De Felice FG, Vieira MN, Bomfim TR, Decker H, Velasco PT, Lambert MP, Viola KL, Zhao WQ, Ferreira ST, Klein WL. (2009). Protection of synapses against Alzheimer's-linked toxins: insulin signaling prevents the pathogenic binding of Aβ oligomers. Proc Natl Acad Sci U S A,106(6):1971-6. Lacor PN, Buniel MC, Furlow PW, Clemente AS, Velasco PT, Wood M, Viola KL, Klein WL. (2007). Aβ oligomer-induced aberrations in synapse composition, shape, and density provide a molecular basis for loss of connectivity in Alzheimer's disease. J Neurosci, 27(4):796-807. De Felice FG, Velasco PT, Lambert MP, Viola K, Fernandez SJ, Ferreira ST, Klein WL. (2007). Aβ oligomers induce neuronal oxidative stress through an N-methyl-D-aspartate receptor-dependent mechanism that is blocked by the Alzheimer drug memantine. J Biol Chem, 282(15):11590-601. Lambert MP, Velasco PT, Chang L, Viola KL, Fernandez S, Lacor PN, Khuon D, Gong Y, Bigio EH, Shaw P, De Felice FG, Krafft GA, Klein WL. (2007). Monoclonal antibodies that target pathological assemblies of Abeta. J Neurochem. 100(1):23-35. Georganopoulou DG, Chang L, Nam JM, Thaxton CS, Mufson EJ, Klein WL, Mirkin CA. (2005). Nanoparticle-based detection in cerebral spinal fluid of a soluble pathogenic biomarker for Alzheimer's disease. Proc Natl Acad Sci U S A,102(7):2273-6. Haes AJ, Chang L, Klein WL, Van Duyne RP. (2005). Detection of a biomarker for Alzheimer's disease from synthetic and clinical samples using a nanoscale optical biosensor. J Am Chem Soc. 127(7):2264-71. Lacor PN, Buniel MC, Chang L, Fernandez SJ, Gong Y, Viola KL, Lambert MP, Velasco PT, Bigio EH, Finch CE, Krafft GA, Klein WL. (2004) Synaptic targeting by Alzheimer's-related amyloid β oligomers. J Neurosci, 24(45):10191-200. Gong Y, Chang L, Viola KL, Lacor PN, Lambert MP, Finch CE, Krafft GA, Klein WL. (2003). Alzheimer's disease-affected brain: presence of oligomeric Aβ ligands (ADDLs) suggests a molecular basis for reversible memory loss. Proc Natl Acad Sci U S A, (18):10417-22. Chromy BA, Nowak RJ, Lambert MP, Viola KL, Chang L, Velasco PT, Jones BW, Fernandez SJ, Lacor PN, Horowitz P, Finch CE, Krafft GA, Klein WL. (2003). Self-assembly of Abeta(1-42) into globular neurotoxins. Biochemistry. 42(44):12749-60. Klein WL, Krafft GA, Finch CE. (2001). Targeting small Abeta oligomers: the solution to an Alzheimer's disease conundrum? Trends Neurosci. 24(4):219-24. Lambert MP, Barlow AK, Chromy BA, Edwards C, Freed R, Liosatos M, Morgan TE, Rozovsky I, Trommer B, Viola KL, Wals P, Zhang C, Finch CE, Krafft GA, Klein WL. (1998). Diffusible, nonfibrillar ligands derived from Aβ1-42 are potent central nervous system neurotoxins. Proc Natl Acad Sci U S A, 95(11):6448-53.